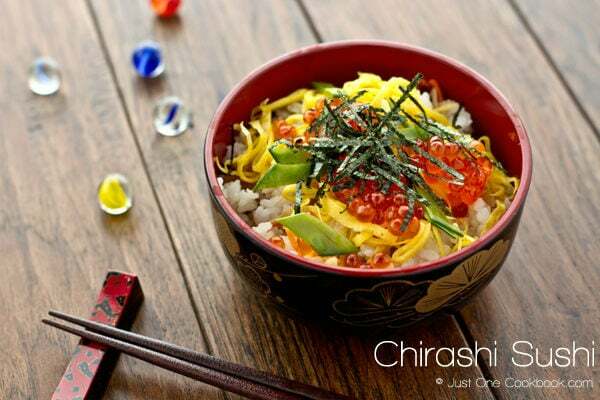 Kinshi Tamago (錦糸玉子) is shredded egg crepe garnish and we use it for Chirashi Sushi and various other dishes. 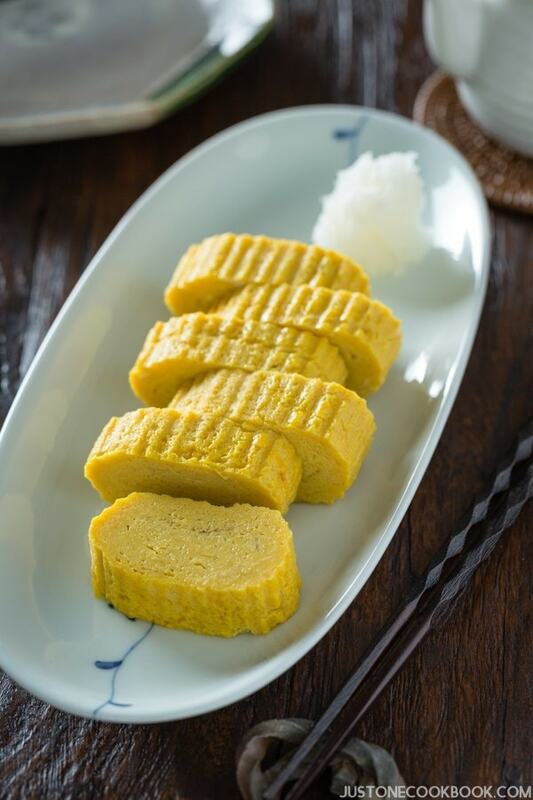 Usuyaki Tamago (薄焼き玉子) is a paper-thin cooked omelet (before thinly slicing to make Kinshi Tamago). We often use it to wrap Temari Sushi. 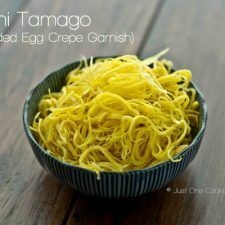 It’s not hard to make but if it’s your first time trying, you probably need to practice a bit as the thinness of the crepe is the key and you need to get a hang of it until you learn how much egg mixture is needed for the size of your frying pan. 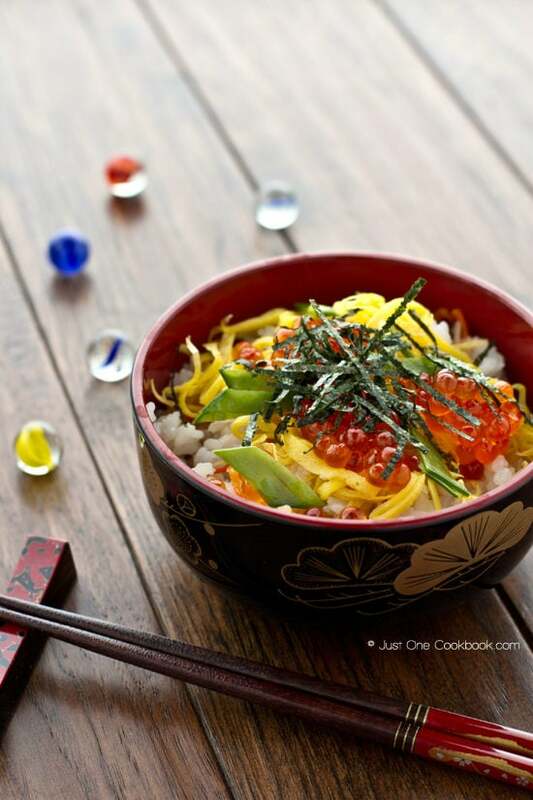 In a bowl, beat the eggs with the whisk and add the rest of ingredients until well combined. 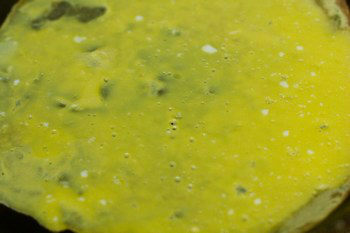 Strain the egg mixture through a sieve at least one time to get a silky smooth texture. Heat a non-stick pan on medium heat. Prepare a moisten towel and place on countertop. Dip a small piece of paper towel in vegetable oil and apply a thin layer on the pan. Before it gets too hot, pour a small amount of the egg mixture into the pan and quickly swirl it around by tilting the pan in all directions. 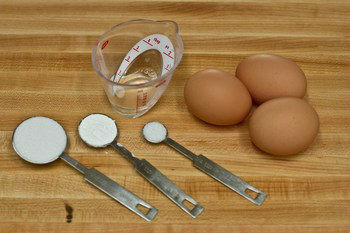 You will know how much egg mixture is required to get the perfect thickness by practicing a couple of times. Then turn off the heat and cover. 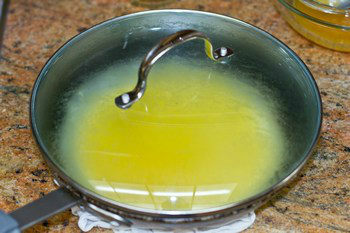 Transfer the pan on top of the wet towel to stop browning the egg. Keep the lid on for 1-2 minutes or until the egg is solidified. The edges are drier so you can use a chopstick or spatula to lift the egg. It should come off nicely. 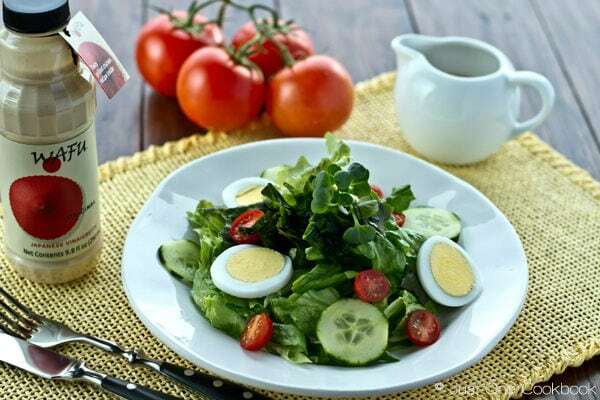 If egg is not cooked completely, then flip the egg and cook on low heat for a little bit. Transfer the egg onto a paper towel and let it cool. 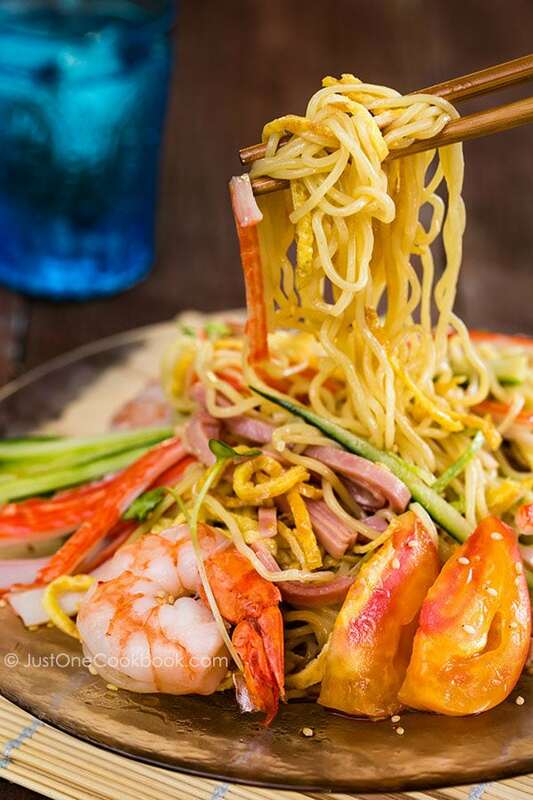 You can lift the paper towel with two chopsticks which are on top of a plate. With this method, heat will escape from the bottom of the egg and cool faster. Repeat this process until all the egg mixture has been used. If there is a burnt spot on the pan, make sure you wipe off cleanly or wash it before working on the next batch. Don’t forget to re-oil between batches. When it’s completely cool down, fold in half, and then roll a crepe into a tight roll from the bottom. 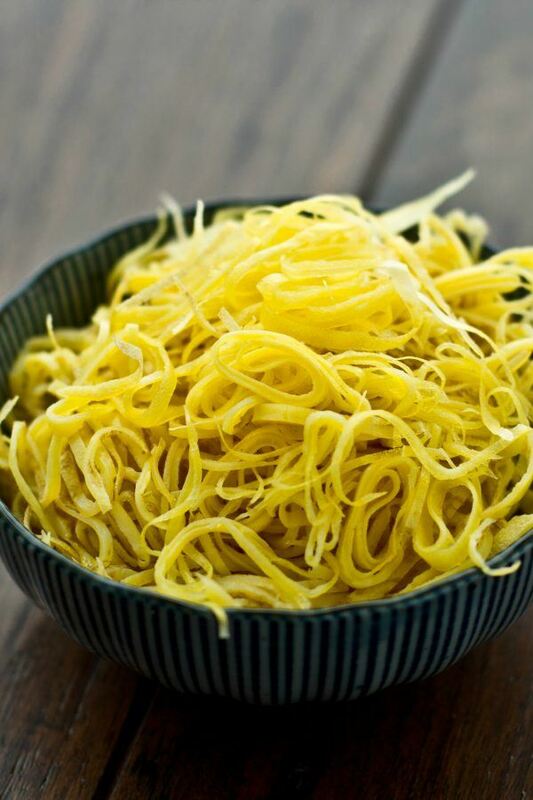 With a sharp knife, cut into thin julienne strips. 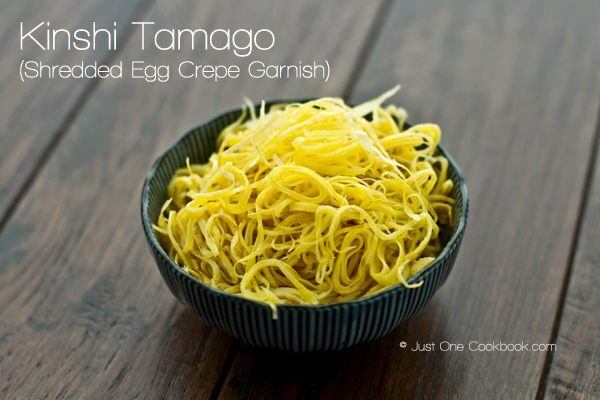 You can freeze Kinshi Tamago for up to 4 weeks. When you are ready to use, defrost naturally or microwave. 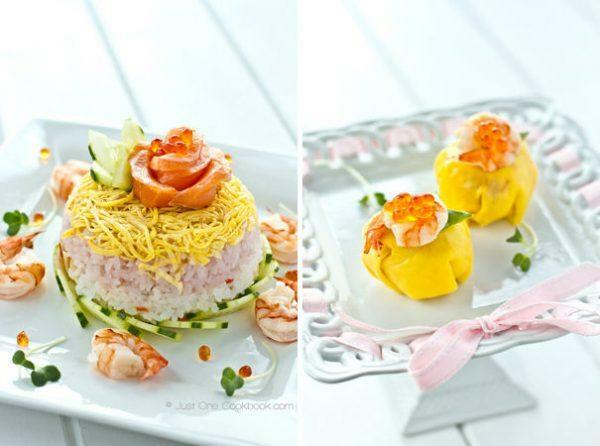 I made the above egg crepe to accompany the chirashi sushi cake on New Year’s Day. When I added the teaspoon of cornstarch to the egg mixture, it lumped up in tiny balls. I was able to get rid of most of those balls when I placed the egg mixture through a sieve. As an after thought, perhaps I should have dissolved the cornstarch in water before adding to the egg mixture. The egg crepes turned out okay (more practice needed though!) and I found it easier to use a wooden chopstick to loosen the egg in the pan after it has cooked. My small spatula was not as effective. 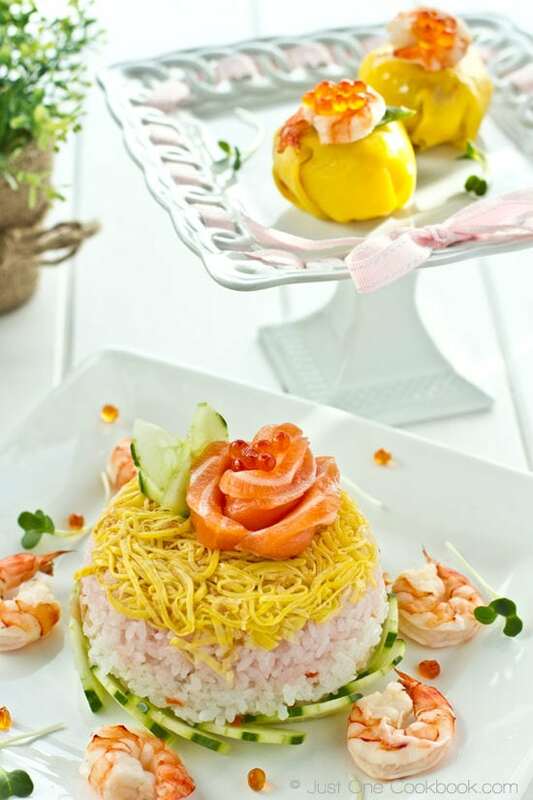 A very pretty dish and easy to make. This was amazing. Thanks so much. I used it for my somen salad. I was so impressed that I was able to get such wonderful looking kinshi Tamago. Most of the kinshi Tamago I see are a bit fluffy because its just avregular omelet that was thinly sliced. I appreciate your tips on straining, covering the pan, removing from stove and letting it sit in covered pan for a few minutes. Those little tips make a big difference. Hi Shawna! You kind feedback made my day! Thank you so much for trying this recipe and I’m happy it worked out! We can make a same thing but to make it perfect and right it requires extra steps… The kind you talk about is easier to make especially if you don’t have time for those extra steps. 🙂 So happy you liked the recipe. Thanks for writing! I made it! I am so excited! I can’t believe I can can succeed on my debut. I have to owe it all to your generous sharing and intelligent cooking tips! I love your blog ever since I tried your Mango Ice Cream recipe. That one has become a big hit for me and the church young people. I personally love your cherry Ice cream the best. All in all, Thank you for being so nice and so neat! I also enjoyed reading your visit to Taiwan. If next time you happen to drop by again, I am willing to be your guide!